If Perth is too far off your radar for some outdoor adventures this summer, Western Australia’s north is renowned for its pristine beaches and waterside attractions, with Cable Beach one of the jewels in the crown. Famous for its sandy white beaches that stretch for 22 kilometres between vivid red ochre cliffs and stunning turquoise waters, Cable Beach is loved for its gorgeous sunsets. The beach is one of the best places to see a spectacular natural phenomenon known as the ‘Staircase to the Moon’, where, between March and November, the exposed tidal flats create the illusion of a staircase leading directly to a blazing red moon: settle back with dinner and camera and watch as the landscape around you transforms into an otherworldly theatre of one of nature’s most spectacular phenomena. During the day, there are many different ways to explore the beach, including four-wheel driving, cycling, sunset cruises or even on camel­back tours. Or, simply walk at your own leisure and enjoy the sense of tranquillity and peace. The cliffs surrounding the beach are also home to many beautiful walking trails, including Indigenous Heritage trails that take visitors past places of great significance to Indigenous Culture and The Dreamtime. You can also learn about Indigenous song cycles, bush medicine and native plants and animals at Minyirr Park, located just at the southern end of Cable Beach. If it’s the area’s unmistakable sense of peace and tranquility that appeals to you most, Cable Beach is home to some of the best fishing in Australia, with billfish, pelagic fish, tuna, mud crabs, barramundi just some of what you can expect to catch in the pristine waters of the Indian Ocean. Stay on the sand for a bit of shore-based fishing, or meet like-minded and enthusiastic anglers on a chartered fishing cruise, where you can learn the secrets of the professionals while catching enough for the rest of your trip. When you return to dry land, stretch your optics back as far as you can to a time long before humans existed, with a stop at Gantheaume Point, where dinosaur footprints believed to be around 130 million years old can be seen at low tide. A spectacular view of migrating whales and dolphins can also be found at the Gantheaume Point Lighthouse, between May and November, when thousands of these majestic custodians of the sea make their way south. Gantheaume Point Lighthouse itself is a deceptively ordinary-looking structure that holds a fascinating history, which includes a period in which it functioned as a nun’s retreat before it was rebuilt in 1984. 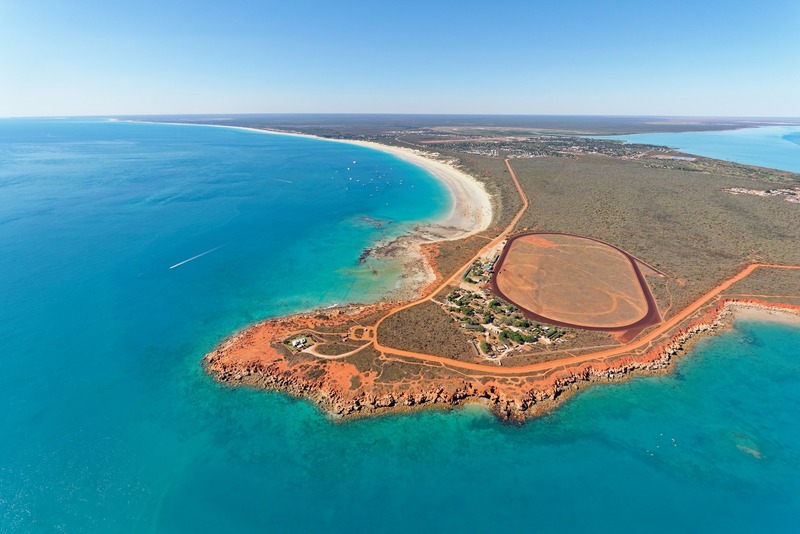 For a more daring venture into the heights, catch a scenic flight Cable Beach. There’s nothing like a chartered flight through the warm spring air to give you an unmatched view over the region. Look out for flights that will take you past the world-famous Horizontal Falls – a rapid-moving tidal flow through two narrow gorges that changes direction depending on the tide – for your chance to see more of nature’s best.